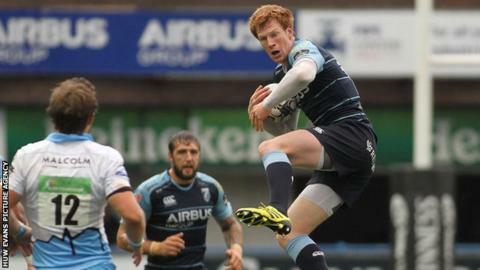 Cardiff Blues fly-half Rhys Patchell will leave the region at the end of the season after rejecting a new contract. The 22-year-old is out of contract at the end of the current campaign and has been linked with the Scarlets. "We are disappointed that Rhys has turned down a contract offer and will move elsewhere at the end of this season," Blues coach Danny Wilson said. "He has played well for us at both full-back and fly-half this season." Wilson added: "I know he will continue to give everything he has for the region until the end of the season." Gareth Anscombe's arrival at the Blues in July 2014 from Waikato Chiefs in New Zealand saw Patchell moved to full-back to accommodate the newcomer. "We have good competition for the number 10 jersey and it is a shame that Rhys will not be a part of that," Wilson added. "We want players who want to be here and fight for a place in the team." Scarlets confirmed in November they were in talks with Patchell, and head coach Wayne Pivac said: "He's certainly one who is of interest to us."